95% of British Muslims feel a loyalty to Britain. 93% say they should obey British laws. 73% said they had no sympathy for the motives behind the Paris attacks. 5% of British Muslims feel no loyalty to Britain. 7% say they should not obey British laws. 27% said they had sympathy for the motives behind the Paris attacks. 139,332 of British Muslims feel no loyalty to Britain. 195,064 say they should not obey British laws. 752,391 said they had sympathy for the motives behind the Paris attacks. 306,530 feel sympathy for people who want to fight against Western interests. Now, certainly, feelings of sympathy for acts of terrorism is neither procurement nor incitement to do the same. But we are concerned here with hearts and minds; notions of allegiance, identity, fraternity and patriotism. 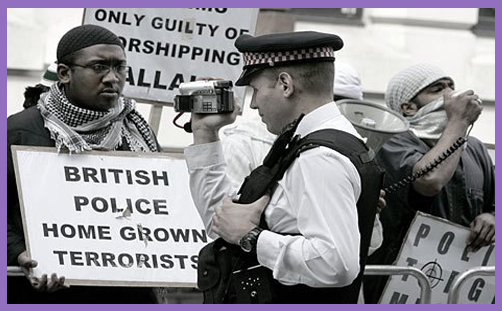 It is probably safe to assume that the 139,332 British Muslims are part of those who do not believe in the Rule of Law and who also have sympathies for the perpetrators of the Charlie Hebdo massacre. Ideological sympathies are of little consequence unless or until they become acts of defiance and rebellion: the mouth speaks what the heart is full of, and limbs tend to do what the mind imagines. So, potentially, there are around 139,332 British Muslims who, in their hearts and minds, hate everything that Britain represents (except, presumably, the compliant liberalism by which they are accommodated and free to express their views). And then we learn that, when asked if someone they knew from the Muslim community was planning an act of violence, 94% would report them (the BBC statistic), meaning 6% would not. So that’s 167,198 British Muslims who would not report a known planned act of terrorism. Notwithstanding that it only takes one Islamist bomb to cause carnage, presumably the BBC would like us to focus on thanking Allah for the 2,619,437 British Muslims who would be vigilant and sufficiently law-abiding to report a known plot to the police. And, of course, we do thank God for them. It is among the most urgent of political tasks to address those matters of poverty and grievance which lead to educational alienation and social exclusion. It is an undeniable defilement of enlightened and reasonable Muslims that the peaceable majority are tarnished by the extremist beliefs, betrayal and potential treason of the minority. But this survey (complete data and methodology HERE), establishes beyond doubt that the minority are by no means negligible, and their quest for a British caliphate is not meaningless. For the number of UK Muslims who might seek to do us harm is now greater than the number in the British Army (regular and reserve). Perhaps, by deflecting from this alarming statistic, the BBC is actually doing us a great service of sustaining community cohesion and maintaining the Queen’s Peace.